Meitarim's mission is to break down the polarization that exists between religious and nonreligious societies in Israel by changing the nature of Jewish education and shared society in Israel. 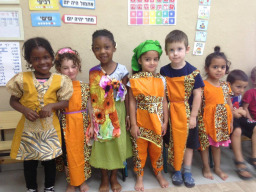 Meitarim was founded in 2001 by Rabbi Michael Melchior, former Knesset Member and minister as a means to offer Israeli children a pluralistic educational experience. Meitarim breaks down the polarization that exists between religious and secular societies by creating a school system that instills in students both Jewish and universal values. In mid-2017 Meitarim expanded its impact beyond the reach of its schools by absorbing Mirkam, an umbrella organization of more than 50 mixed religious-secular communities in Israel, into its operations. Meitarim now works to strengthen communities in which residents seek to live together and create a diverse and tolerant Jewish lifestyle. Meitarim is now addressing the issue of pluralism in its entirety by providing both a platform for education and for shared living. Today, Meitarim schools are found in communities throughout Israel, from Natur in the Golan Heights to Yeruham in the South. With over 10,000 students and staff members in over 70 institutions from kindergartens through post-high school leadership programs, students are forging partnerships across the different sectors of Jewish society. Our schools and communities are producing adults who are critical thinkers, equipped to define the meaning of Israel as a Jewish and democratic state. Meitarim helps break down the polarization that exists between religious and secular societies, strengthens Jewish peoplehood and creates a pluralistic educational and social environment based on values of tolerance, humanism and mutual respect. In contrast to having groups with different collective identities wall themselves off from each other for fear of losing their individual identities, Meitarim provides a platform for finding our broadest common ground as Jews and Israelis and creates a place in which students and community members learn to honor, respect and tolerate the other.